How Does DVD Upscaling Compare to Blu-ray? How Does Standard DVD Upscaling Compare to Blu-ray? With the advent of HDTV (and, more recently, 4K Ultra HD TV), the development of components to match the resolution capabilities of those TVs are becoming more important. As a solution, most DVD players (the ones that still available) are equipped with "upscaling" capability to better match the performance of the DVD player with the capabilities of the today's HD and 4K Ultra HD TV's. However, the presence of Blu-ray disc format has confused the issue regarding the difference between the upscaling of standard DVD and the true high definition capability of Blu-ray. For an explanation of DVD video upscaling and how it relates to true high definition video, such as Blu-ray, keep on reading. The DVD format supports a native video resolution of 720x480 (480i). This means that when you put a disc into a DVD player, that is the resolution that the player reads off the disc. 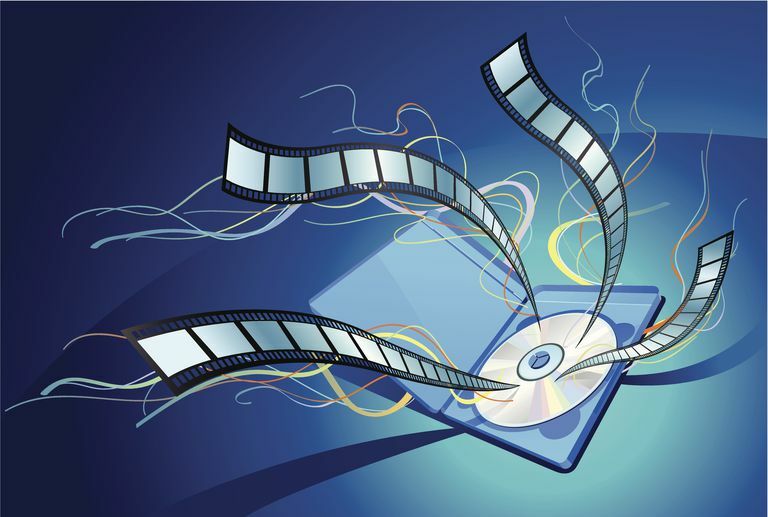 As a result, DVD is classified as a standard resolution format. Although this was fine when the DVD format debuted in 1997, soon after its release DVD player makers made the decision to improve the quality of DVD images via the implementation of additional processing to the DVD signal after it was read off the disc, but before it reached the TV. This process is referred to as Progressive Scan. Progressive scan DVD players output the same resolution (720x480) as a non-progressive scan enabled DVD player, however, progressive scan provided a smoother looking image. 480i represents 720 pixels displayed across a screen horizontally and 480 pixels down a screen vertically. This arrangement yields 480 horizontal lines, which are, in turn, displayed alternately. In other words, all the odd lines are displayed, followed by all the even lines. 480p represents 720 pixels displayed across the screen horizontally and 480 pixels down the screen vertically. This arrangement yields 480 horizontal lines on the screen, which are, in turn, displayed progressively, or each line displayed following another. Although progressive scan provided improved quality images on compatible TVs, with the introduction of HDTV, it was soon apparent that even though DVDs only provided a 720x480 resolution, the quality of those source images could be improved even further by implementing a process called Upscaling. Upscaling is a process that mathematically matches the pixel count of the output of the DVD signal to the physical pixel count on an HDTV, which is typically 1280x720 (720p), 1920x1080 (1080i or 1080p), and now, many TVs feature 3840x2160 (2160p or 4K). 720p represents 1,280 pixels displayed across the screen horizontally and 720 pixels down the screen vertically. This arrangement yields 720 horizontal lines on the screen, which are, in turn, displayed progressively, or each line displayed following another. 1080i represents 1,920 pixels displayed across a screen horizontally and 1,080 pixels down a screen vertically. This arrangement yields 1,080 horizontal lines, which are, in turn, displayed alternately. In other words, all the odd lines are displayed, followed by all the even lines. 1080p, represents 1,080 horizontal lines displayed sequentially. This means all lines are displayed during the same pass. 4K (or 2160p), on the other hand, represents 3,480 horizontal lines displayed sequentially. This means all lines are displayed during the same pass. 4K is the highest quality HD display format. Visually, there is very little difference to the eye of the average consumer between 720p and 1080i. However, 720p can deliver a slightly smoother-looking image, due to the fact that lines and pixels are displayed in a consecutive pattern, rather than in an alternate pattern. However, upscaling, as it is currently implemented, cannot convert standard DVD images into true high-definition (or 4K) images. In fact, although upscaling works well with fixed pixel displays, such as Plasma, LCD, and OLED TVs, results are not always consistent on CRT-based HDTVs (fortunately there aren't too many of those still in use). Any DVD player can be hooked up to an HDTV. Although upscaling DVD players are better able to match the native pixel resolution of an HDTV, you may good results on a standard DVD player (with no progressive scan or upscaling capability) that is connected via an HDTV's provided Component or S-Video inputs (Note: most newer TVs no longer have S-video inputs). If you DO have an HDTV (or 4K Ultra HD TV), and a standard DVD player, you will get the best results using the Component video connection (red-blue-green) between the DVD player and the HDTV. In addition, if your DVD player is progressive scan capable, always use that option when connected to a progressive scan capable T. However, if your DVD player also has upscaling capability, it will have an HDMI connection. Use the HDMI connection to access the DVD players upscaling capabilities. DVD video upscaling is only an approximation of the high definition viewing experience. To get the full impact of true high definition viewing from a disc format, you need to have a Blu-ray player connected to an HDTV via an HDMI connection and be viewing actual Blu-ray disc content. The Blu-ray disc format supports native 720p, 1080i, and 1080p resolution content. Upscaled DVD (even when its good) still does not match the quality of a native Blu-ray disc source. In comparison to Blu-ray disc, upscaled DVD tends to look a little flatter and softer (especially in the background) than Blu-ray. Also, in terms of color, when looking at Reds and Blues, it is also easy to tell the difference in most cases, as even with upscaled DVD, reds and blues have a tendency to override detail that may be underneath, while the same colors in Blu-ray are very tight and you still see the detail under the color. All Blu-ray Disc players can perform the upscaling function for standard DVDs, provided the Blu-ray Disc player is connected to an HDTV (or 4K Ultra HD TV) using the HDMI connection option. In the case of Ultra HD TVs, although an upscaling DVD player can only upscale DVD to a 1080p — the Ultra HD TV will accept that signal and further upscale it to 4K Ultra HD. Also, some Blu-ray Disc players have built-in 4K upscaling for both DVD and Blu-ray Disc playback. If a Blu-ray disc player does not provide this feature, once again, the 4K Ultra HD TV will further upscale the 1080p signal from the Blu-ray Disc player to 4K. The HD-DVD format was officially discontinued in 2008. However, for those that may still own and use an HD-DVD player and Discs, the same explanation posted above also applies to the relationship between DVD Upscaling and HD-DVD as it does between DVD upscaling and Blu-ray disc.